Most people don't give street lights a second thought, and possibly quite rightly so. But the next time you're driving home of an evening, take a look up at those mighty trunks that sprout at each side of the road, with their sodium flowers burning brightly, spreading warm bands of sickly yellow light over the nocturnal tarmac. Ask yourself, where did they come from? Forged in the smoky steel mills of some soot-stained Midlands town? 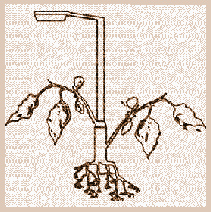 You'd be forgiven for thinking so, but the truth is somewhat different, for every lamppost that lines our highways and byways is grown from seed. And were it not for the recklessness and scandal that propelled Sir Barnaby Tonk halfway around the globe almost a hundred and fifty years ago, we would not be basking in the light of these magnificent specimens today. Stories of the great 'light poles' of South America were circulating long before their full potential was realised. Adventurers and explorers in the New World often returned with tales of the continent's extraordinary flora and fauna, and such accounts were usually taken with the pinch of salt that many of them no doubt deserved. It would take a man of extraordinary vision and stupefying credulity - not to mention criminal wealth - to recognise the true worth of such wonders of nature. That gentleman turned out to be Sir Barnaby Tonk, later Lord Tonk of Huddersfield. Sir Barnaby, a man of considerable means, was the very epitome of the idle rich. He was a rather restless fellow, and though he pursued many interests during his lifetime, none lasted more than two or three weeks. He was, on various occasions, an astronomer, a poet, swordsman, billiard player, alchemist, artist or whatever else happened to take his fancy at the time. He dabbled restlessly, latching onto some endeavour on a whim, reading all he could read, soliciting the opinions of experts and artisans, kitting himself out with the requisite equipment and then suddenly dropping the whole idea in favour of the next mad fad to catch his attention. Suddenly Sir Barnaby would be all of a dither about cricket. He'd mark out a pitch in his ample grounds, buy himself all the gear, the whites, the bat, form his own team and then... Flop. Next morning he would wake up firmly of the opinion that cricket was an absolute bore, and would set out to pursue the noble craft of pottery instead. One subject that, oddly enough, failed to grab Sir Barnaby's attention was botany. Oh certainly, Sir Barnaby appreciated Mother Nature and all her works, but there was only one particular aspect of her handicraft that really interested him. Indeed, it was the one single pursuit that he followed unwaveringly throughout his lifetime. You see, Sir Barnaby had something of an eye for the ladies. In fact, the enthusiasm with which he invested his appreciation of the female form was such that, by today's standards, it might almost be considered an addiction. An addiction, what's more, which he indulged with such dedication and assiduity as would make your nose bleed. Oh yes, Sir Barnaby may have spent many of his years as a bachelor, but rarely did he forgo the pleasures of female companionship. Since he had been a mere slip of a lad, he had always known that his staggering quantities of cash were a natural aphrodisiac and he had wasted no time in investing his considerable fortune in the pleasures of the flesh. And, let me tell you, he could buy a hell of a lot of flesh. Inevitably, Sir Barnaby's unshakeable determination to 'put it about like something not right' created its own particular difficulties. This was, after all, Sir Barnaby Tonk. Everyone knew Sir Barnaby Tonk and wherever he went in the parish he was recognised. Furthermore, his movements were regularly reported in the local broadsheets and his name was dropped with something approaching wild abandon within polite society. A couple of minor scandals in his youth had already been the cause for much gossip, and it would take only the merest suggestion of impropriety for his past indiscretions to resurface and embarrass him. After all, the Tonks had a reputation to uphold. And whilst concern for the good name of the family did not convince Sir Barnaby to desist in his debauchery, it did at least teach him to be more circumspect. Disguise - that was the answer! By passing himself off as a stranger, he could indulge in all manner of wantonness with impunity. And, as luck would have it, Sir Barnaby already had the means to affect such a subterfuge. Some years previously, he had indulged a fleeting passion for amateur theatricals. Indeed, he had planned a one-man show, and had even got as far as printing up the programmes before he decided that the whole thing was wretched and cancelled the performance at the last moment. Much to the relief of the friends and family who were expected to attend, it should be noted. Nevertheless, he still had all sorts of props and costumes locked away in storage. These, he determined, would now be put to proper use. As might be expected, his initial forays into the world of self-concealment were not successful. Sir Barnaby had at his disposal a fantastic selection of beards, hats, false noses, eyebrows and so on, and found himself quite unable to resist the temptation to use everything. Concealed by a huge wiry beard, his face distorted by ill-fitting false teeth, and with a lank and greasy wig covering his own naturally lank and greasy hair, he slipped out of the house and made for the local tavern. The exercise was at least a partial success, in that no one there present could possibly have determined his true identity. Sadly, he found that his freakish appearance drew unwarranted attention and derision. More importantly, he completely failed to pull. But practice made perfect, and Sir Barnaby soon learned that less was more. He found that he could disguise himself adequately enough to pass all but the most rigorous of inspections; and, happily, the young ladies who inspected him most rigorously were judicious enough to keep the matter to themselves. Until, that is, a young maid called Sally Cropper contracted that most hideous of afflictions - she fell in love. In her exuberance she became less than discreet, and, inevitably, her father got to hear of her amorous encounters. Now, Mr Cropper was a fair man, a reasonable sort, but he did own a shotgun and he was acutely aware of how persuasive such a weapon could be when it came to difficult negotiations. He demanded that Sir Barnaby do the decent thing and make an honest woman of his daughter. Sir Barnaby, on the other hand, was not fair and reasonable. Furthermore, he did not own a shotgun, since the weapon that he had inherited from his father had been confiscated by the magistrate, after Sir Barnaby had accidentally shot a washer woman in the arse whilst out on a duck hunt. Therefore, short of running away to South America, there was really nothing he could do but marry the girl. The choice was clear, and so the following morning, just as the sun was rising through the frail mists that had settled over the hills in the night, Sir Barnaby packed his bags, caught a stage to Southampton and took the first available boat to Buenos Aires. Then, almost five years to the day of his departure, news reached the civilised world of a strange, hairy wildman, who lived in the deepest, darkest depths of the Amazon jungle, and attacked European travellers on sight. Could this be Sir Barnaby Tonk? No, as it turned out it was just some local nutter - but, coincidentally, Sir Barnaby did reappear at around the same time. He turned up in London, and the intervening years had evidently been kind to him, for he was accompanied by a considerable entourage and could afford to take a suite of rooms at one of the city's plushest hotels. It emerged that whilst he was in the New World, he had quickly spotted the potential of the Amazonian light poles (Lampposts, remember? We spoke about them earlier) and had sold them to governments and city authorities all around the globe. He had now returned to offer the same service to the country of his birth. At last! The streets were alive with light. Nightlife flourished, crime rates halved, and finally people could see just exactly what they were stepping in. And Sir Barnaby? Well, he was hailed as a national hero. More importantly, he was rich enough to have Mr Cropper shot. He returned to his ancestral seat, where he spent the rest of his days learning to play random instruments, making pyramids out of playing cards and screwing various members of the domestic staff. And you thought a lamppost was just a big stick in the ground?